A team of researchers including U of A engineering and physics faculty has developed a new method of detecting single photons, or light particles, using quantum dots. Single photon detection is a key element to enable use of quantum information, a method of transferring information that is much faster and more secure than current methods. This technology has other applications as well, including biological and medical imaging, spectroscopy, and astronomical observation. Shui-Qing "Fisher" Yu, associate professor of electrical engineering; Greg Salamo, distinguished professor of physics; and Yang Zhang, a post-doctoral fellow in electrical engineering at the time, worked with colleagues from Dartmouth and the University of Wisconsin on this research, which was recently published by ACS Photonics. Quantum information uses different quantum states of particles, such as polarization or phase, to encode information. Because quantum information is not limited to the ones and zeroes used to encode digital information, this technology can transfer a large amount of information very securely. Since quantum information can be transmitted using an infinite variety of quantum states, the sender and receiver must both agree on which state they are using to encode and interpret the data. An outsider intercepting the signal would have little way of reading it without this knowledge. A photon is a quantum of light. When a photon enters a detector in a quantum information system, its energy is transferred to an electron and this results in a current or a voltage. This effect is so small, though, that it is difficult to detect. Other designs for photon detectors solve this problem by using a device called an avalanche photodiode to amplify the current or voltage, but this approach tends to add delays to the detection and increases background noise. 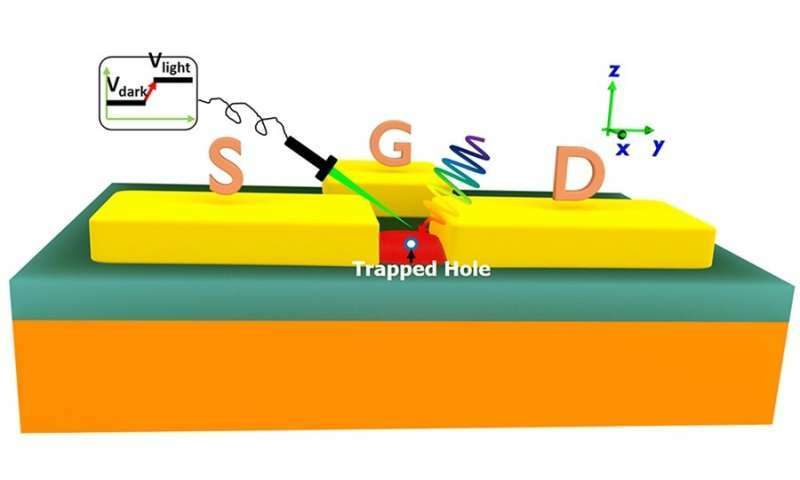 The new approach created and modeled by these researchers uses a quantum dot, which is a semiconductor nanoscale particle, to detect single photons. Compared to other methods, the change in voltage caused by a single photon in this detector is large, with a low background noise level. Yu compared this to adding a drop of water to a container. "If you put one drop of water in a large tank, that change is hard to see," he said. "But if you put a drop of water into a very small container, you can see the change more easily." In the researchers' design, the electron is in a small container – the quantum dot. The researchers have used computer models to demonstrate that their design can detect single photons more accurately than existing technologies.